Despite how advanced mobile phones get, they’ll never replace our trusted, reliable cameras. However, mobile phone applications are being continuously developed to help us through everyday life with a bit more ease, and this goes for filmmaking as well. So, we’ve pulled together a few of the most popular apps for adventure filmmakers, to help you capture incredible shots to be proud of. This app reforms the traditional viewfinder into a more convenient digital application with better accuracy and improved adaptability. Once you’ve taken a photo on your phone, you can use this app to create a preview of what your image will look like with different lenses, fields of view and focal lengths. This is great for allowing you to select the right equipment to dial in the perfect set up for the scene you want to capture - taking out most of the faff setting up time. You can even record video, trim the ends and add custom title cards! All the images taken are embedded with useful information such as GPS data, focal length, camera format which can all be saved and shared effortlessly. Never miss a golden hour again with this nifty app. Sun Surveyor is your personal guide to the sun and the moon, so you know where they are, where they will be and when. Using a few cool features, this app gives you a complete picture of the sun throughout the day, including previews of how it’ll look, wherever you are. You’ll receive instant information about sunrise, sunset and golden hours so you can plan your shoots hours in advance. Some other features include a live view of the projected sun and moon positions, offline mode, 360-degree panoramic information, and more. For additional information on the Sun Surveyor app, head over to their website. If you use models for your work or owned-property, then you’re probably going to need release forms, and sometimes, you need them pretty immediately. Fortunately, Easy Release is the app for getting you out of any possible legal release bind. With a stack of templates to use, you can create a complete universal model and property release forms on the go. With room for signatures, you can have your legal side signed and sealed on location with this handy app. Available in 17 languages, completed forms can be easily uploaded to Google Drive or Dropbox in both PDF and JPEG formats. 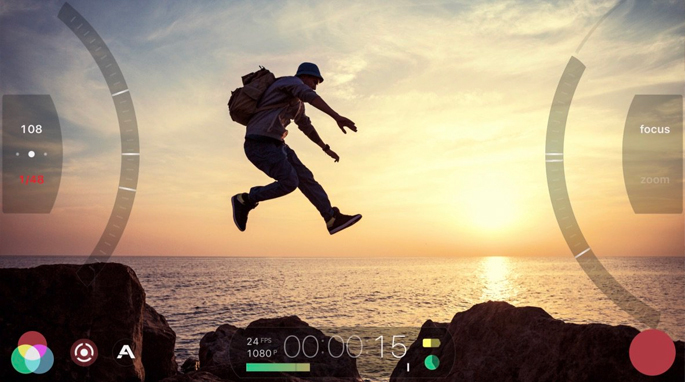 If you need any backup footage, behind the scenes action or you want to test out some locations, and you don’t have all your kit with you, then download FiLMiC Pro to your phone. Boost your phone’s camera features to shoot high-quality video with customised focus, exposure, shutter speed and white balance while storing key image data. 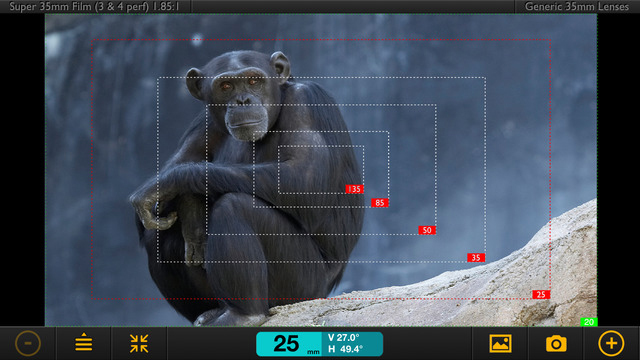 This app includes plenty of manual controls for you to play with as well; it even supports up to 240 FPS, a histogram, waveform monitor and lots more. It’s recommended that you try the evaluation version first to ensure the app runs well on your mobile phone. For additional information about this app and all its features, head over to the FiLMiC Pro website. When you’ve got multiple projects on the go, and you need some help organising what shoots are happening where and with who, Shot Lister will be your saving grace, your personal digital assistant. 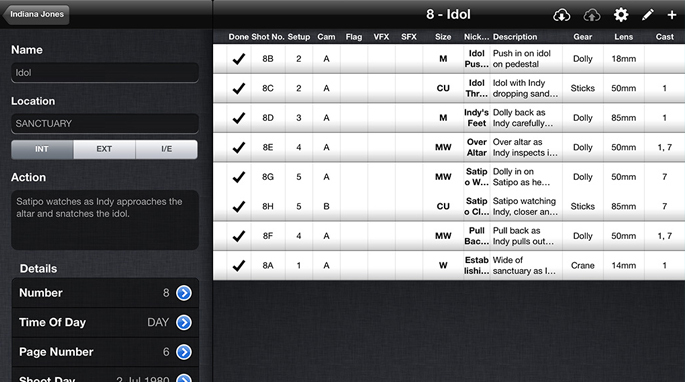 You can manage your edits, shoot days, storyboards and project schedule all in one app. There are two versions available, a one-off cost option which allows you to create your schedule, and another version with a subscription cost which enables you to do much more, like importing scripts and storyboards. For more information on the ins and outs of Shot Lister, head over to their website.